From changing a tire to removing a gallbladder, there’s no substitute for learning by doing. Most of us learn more effectively when we get hands‑on experience, and medical simulators are bringing entirely new experiential learning opportunities to medical students around the world. The potential value of using medical simulation technology in medical schools is unquantifiable, so it’s no surprise that investors are flocking to startups offering applications for this advanced educational technology. At Innovation Park on Dec. 6, seven technology startups presented their business ideas before a panel of judges and their peers. They competed with the hopes of winning up to $10,000 in prizes from Ben Franklin Technology Partners. While each pitch offered a unique value proposition, the judges awarded the top prize to Medulate, an‑up‑and‑coming startup offering medical simulation products designed to provide medical students with the best possible medical training. 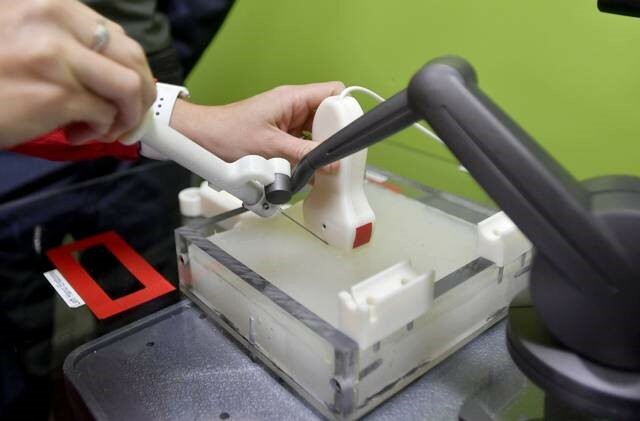 Medulate uses advanced software, robotics, and human tissue modeling applications to develop realistic medical simulations that students can use to practice their skills. In addition to offering a realistic simulation of human medical care, Medulate’s systems are designed to provide individualized feedback to students training on their devices – something that a cadaver could never do. Once all the startups presented, the judges awarded Medulate the top prize and $10,000 for developing a suite of medical simulators geared at increasing the efficiency and effectiveness of medical education. “We’re thrilled we were able to convince others to believe in our company as much as we do. This money means a lot as we build our business and improve the educational experience for medical students. If you told us three months ago that we would be in this position, we wouldn’t have believed you. Thank you to Ben Franklin and Invent Penn State for this incredible opportunity,” said Scarlett Miller, co‑founder of Medulate. 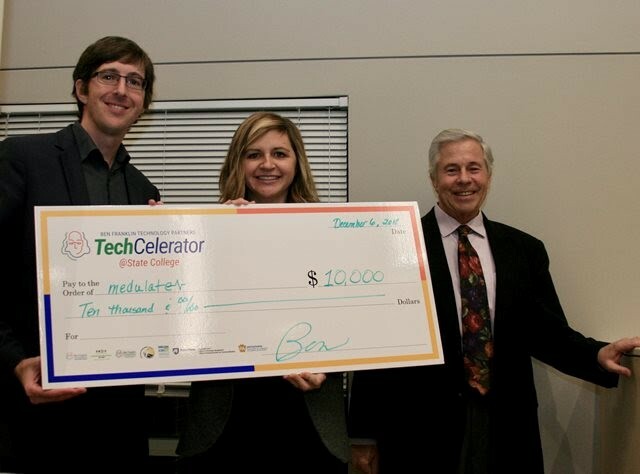 The startups are graduates of Ben Franklin's TechCelerator@StateCollege program, a pre‑business accelerator held twice a year in State College and once in Altoona, Johnstown and Somerset, with more to be held in the future. “The TechCelerator this semester has an exceptional group of ‘townies,’ undergrads, grad students, and professors. Having a front row seat to see these new startups launch is really thrilling. On top of that, I get to work with some of the most inspiring economic development people I have ever met, including our leader, Steve Brawley. Invent Penn State is a world‑class organization and I feel very lucky to be part of it,” said Bob Dornich, director of the TechCelerator. Actinic, a company that developed a technology that decreases the curing time for silicones and other thermoset polymers so they can be used in 3D printing processes. Propter Hoc Imaging, which developed a high‑powered yet low‑cost microscope that can be used with educational applications. GreenBriq, a company that creates alternative, sustainable fuel sources from invasive plant species in locations of the world where charcoal is scarce and expensive. Go2Gro, who developed a delivery system platform that gets orders picked up and delivered to a home or business within two hours or less. Kijenzi, a startup that developed 3D printing capabilities to allow manufacturers within sub‑Saharan Africa to make replacement parts for medical equipment. Power Ink, which has developed a method to harvest collagen (BIO‑ink) that can be 3D printed and someday used in surgical procedures. Ben Franklin deploys a team of at least six experts along with colleagues from the Small Business Development Center in order to mentor and guide students through the steps to starting a company. And with the State College area slowly transforming into Central Pennsylvania’s next tech hub, there’s plenty of promising new enterprises that the experts at Ben Franklin can help. From startups to established companies, businesses are heading towards Centre County because it’s affordable, offers a strong potential customer base and is home to a skilled group of dedicated and well‑rounded workers. Medulate is only one example of the types of new enterprises that investors are funding in the State College area, but Innovation Park is full of forward‑thinking entrepreneurs and bold small businesses looking to make their mark in the growing tech space. There’s no telling what’s coming next, but one thing is for sure – investments in next‑generation tech startups are helping communities across Pennsylvania build stronger local economies.